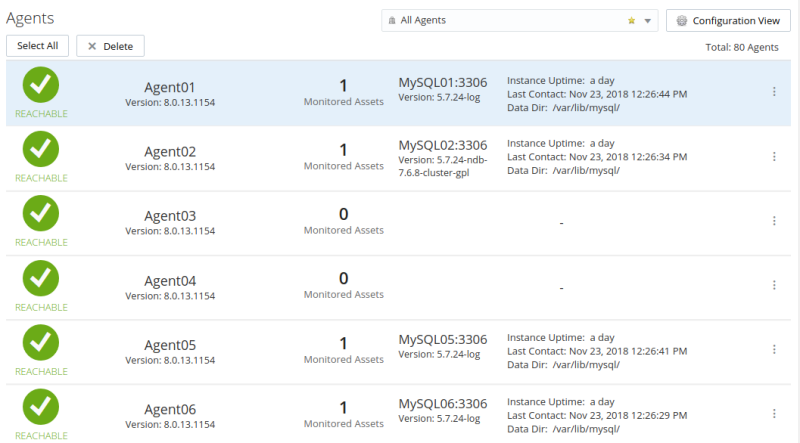 The Agents view configuration view enables you to view all MySQL Enterprise Monitor Agents currently registered with the MySQL Enterprise Service Manager. 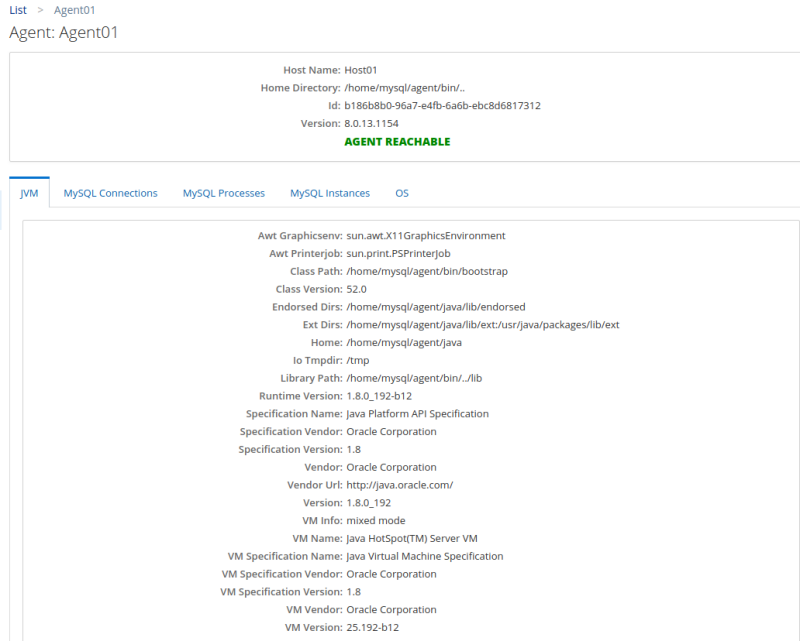 To view the agent status and configuration, select Agents from the Configuration section of the navigation bar. The agents are displayed on individual lines, with brief summaries of their current status, number of assets monitored by the agent, and last contact. To view detailed information on the agent's configuration, select Details from the more info menu on the right-hand side of each line. It is also possible to delete agents from the MySQL Enterprise Monitor inventory using the Delete option. For more information on deleting assets, see Section 16.4, “Deleting Assets”. JVM: displays the details of the agent's Java Virtual Machine (JVM). MySQL Connections: (displayed only if the agent is monitoring an instance) lists all the MySQL connections currently monitored by the agent and their configuration details. Information such as whether self-signed certificates are permitted, timeout values, hostnames, and so on. MySQL Processes: (displayed only if the agent is monitoring an instance) lists all the monitored MySQL processes. Information such as the arguments with which the process was started. process ID, and so on. MySQL Instances: (displayed only if the agent is monitoring an instance) lists all the monitored MySQL instances. Information such as the version, status, uptime, and so on. OS: (displayed only if the agent is configured to monitor the host) : displays detailed information the host operating system, file systems, CPUs, and so on.